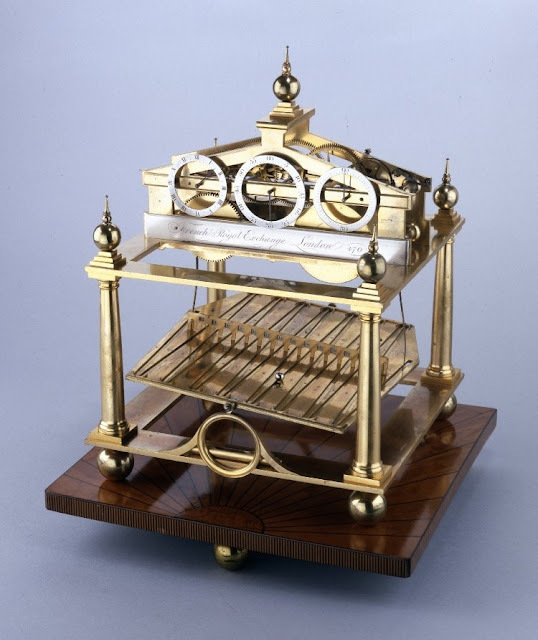 In the early 19th century, an Englishman named Sir William Congreve invented an unusual clock that kept time using balls rolling down an incline. At that time, most clocks kept time through the regular swinging of a pendulum. The Congreve rolling ball clock consists of a brass plate with a zigzag path carved on it. A small brass ball rolls down the carved track, and when it reaches the end of the track, the ball hits a lever and a spring raises the end of the plate, reversing the tilt of the plate and sending the ball rolling back the other way. The lever also advances the clock hands by the same amount of time the ball takes to run down the tracks. In most designs this is 15 seconds, but in some larger clocks it can be as long as one minute. 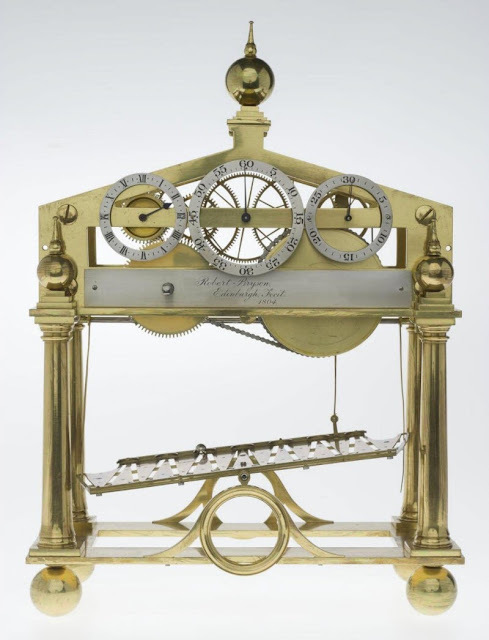 While Congreve is often credited with the invention of the rolling ball clock, it wasn’t an original design. Such clocks had been made previously by the French inventor Nicolas Grollier de Servière and the German clockmaker Johann Sayller, both in the 17th century. Some sources maintain that Congreve was unaware of the existence of these designs, but according to Mark Frank, who runs a website devoted historical timepieces, Congreve “may have assimilated some of the details from a clock made by Johann Sayller”, especially since both designs employed a zigzag track. Grollier's rolling ball clock, on the other hand, had a straight track. One way Congreve’s design differs from Sayller’s is that the latter used a number of balls and a fixed table rather than the single ball and tilting table employed by Congreve. Congreve attempted to make an “extreme detached escapement”, as he described in his patent. In reality, the clock’s accuracy was vulnerable to many external factors. The assistant conservator of technology at the National Museum of Scotland, Darren Cox, wrestled with one clock for two months with little success. ”The clock and the tilting table (front and back) need to be totally level. I have found that, even with the temporary cover I have made for it to keep the dust out, the metal ball needs to be polished at least once every two weeks to remove debris,” he explains. Dust was the biggest problem. The time taken by the ball to roll down the inclined track varied greatly depending on the cleanliness of the track and the ball. In addition, the metal expands or contracts with changes in temperature, altering the length of the track and size of the ball. Darren Cox found the clock would lose or gain as much as 45 minutes a day. While the Congreve rolling ball clock was a notoriously poor timekeepers, they are undeniably beautiful and fascinating to watch. Rolling ball clock at the British Museum. Rolling ball clock at the National Museum of Scotland.